5-03 Bryant Pl has to be one of our favorite homes for sale in Fair Lawn this year. Its abundant charm is evident from first approach – gorgeous landscaping, wrought iron fence, lemonade porch for cool, breezy days, and stylish molding and woodwork throughout. It also has a deep, fenced lot with room to grow, and endless possibilities for any buyer. This amazing home is enjoying a major adjustment in price today. This is sure to draw a lot of attention. While others look to the Spring and Summer as prime times to buy, this early winter season can be full of amazing deals for buyers but you need to act quick. Motivated sellers (like this one) are offering amazing homes poised to move quickly. Don’t wait on this one! If this reduction just brought this home within your price range, or you passed over it for any reason before today – you NEED to see this home right now. See what you’ve been missing and act quick. We have made a major improvement to the price of this listing, now on the market at $339,900. Let us show you around, and demonstrate that this amazing home has always been a find, yet managed to become a steal! Gorgeous Outdoor Space with Patios, Fire Pit, Garden, and More inside a Privacy Fenced Yard. Stunning Indoor Space Boasts Open Floor Plan, Updated Kitchen and Baths, Full Finished Basement that makes this home HUGE and big bedrooms to match. CHARMING, UPDATED CAPE WITH AMAZING DETAILS. BEAUTIFUL CURB APPEAL GREETS YOU ON FIRST APPROACH, FROM THE UNIQUE WROUGHT IRON GATE AND IMPECCABLE LANDSCAPING, TO THE CLASSIC LEMONADE PORCH. STEP INSIDE TO A FORMAL LIVING ROOM WITH ATTRACTIVE PANELING AND ELEGANT CROWN MOLDING. STUNNING HARDWOOD THROUGHOUT. UPDATED FULL BATH WITH MODERN FINISHES AND TWO LARGE BEDROOMS ON FIRST FLOOR (ONE CURRENTLY USED AS DINING ROOM). UPDATED KITCHEN WITH TILE FLOORS, BEAD-BOARD DETAILS AND GRANITE COUNTER. SECOND FLOOR HAS LANDING/LOFT AREA WITH STORAGE AND MASSIVE THIRD BEDROOM WITH SKYLIGHTS. DEEP, FENCED LOT WITH BIG YARD, STORAGE SHED AND SPACIOUS PATIO PERFECT FOR ENTERTAINING. FULL BASEMENT, FINISH TO SUIT. FORCED AIR GAS HEAT, NEWER WINDOWS AND ROOF, TRANSFERABLE HOME WARRANTY. PRIME FAIR LAWN LOCATION NEAR SHOPPING, DINING, HOUSES OF WORSHIP AND TOP RATED SCHOOLS. Check back for more information about this exciting Fair Lawn, NJ real estate opportunity. The only thing that could make this great listing and incredible price reduction sweeter is that it is listed with The Zamir Group – Bergen County’s premier real estate team. 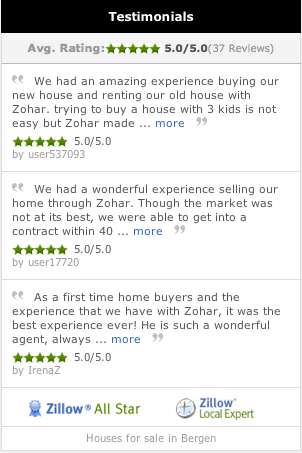 Led by Top Producer Zohar “Zack” Zamir – who was just named the #1 sales agent in all of Fair Lawn (2014-2016) as well as Keller Williams top salesperson (both by sales volume and number of transaction) for all of Bergen County last year. We are also the #1 selling group in the entire NJMLS 2016 YTD! Our team employs a diverse array of Realtors with rich experience. We know how to buy, sell, rent and invest – and we know Bergen County. We also feature a dedicated support staff with full time operations and marketing professionals who ensure smooth transactions and the highest level of visibility to our properties. We bring together sellers and buyers for a smooth and rewarding experience – every time. This listing won’t last long at this amazing new price point. Stop by on Sunday or better yet, CALL TODAY to take a look and see all that this amazing house has to offer. We’re waiting for you!